Beer and pretzels have been a favorite pairing of beer drinkers since… well, since beer and pretzels have existed. 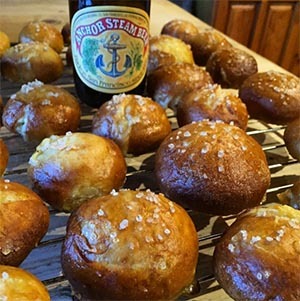 The saltiness of a pretzel pairs particularly well with the crisp finish and rich, distinctive flavor of Anchor Steam Beer, so when we saw a photo of these cheesy pretzel bites made with Anchor Steam, fresh out of the oven, we had to know more. Adam McGuigan, a member of the Anchor Instagram community, originally saw the recipe on Buzzfeed. While reading through the ingredients, he figured a version using Anchor Steam sounded tempting, so he gave it a shot. Adam’s photo of the results is below, along with the recipe. If you end up giving these a try yourself, send us a photo! Cheers, and bon appétit. Bring five cups of water to a boil in a medium pot. When you’ve finished putting together your pretzel bites, add the baking soda to the water and immediately scoop in your pretzel bites. Boil for 20-30 seconds, then take out and place on a baking sheet lined with parchment paper. In a small bowl, combine one egg and two tablespoons of beer and beat with a fork until they are well blended. Brush the mixture onto the top of each pretzel bite, then top with coarse salt. Bake for 15-20 minutes (or until they have browned). As the fresh-baked pretzel bites cool, open a chilled Anchor Steam Beer to enjoy with them. Cheers!